You’re making your rounds through the grocery store, checking boxes off your to-buy list. A fresh bag of coffee is one of the items, and you decide you want to try a different roast than your normal go-to blend. There’s a myriad of special flavors, from mocha to pumpkin spice, to ones that read of orange notes and subtle currant. There’s a variety of roast levels, and there’s two words that you can’t quite distinguish the difference between or the significance of: Arabica and Robusta. You’ve seen it printed across countless foil bags, bottles, and Starbucks products, but you’ve never paid it much mind as to what it actually means. Robusta and Arabica mean, in short, the quality of the bean you’re buying. They refer to the taste, to the caffeine level, to the location from which they yield, and to their respective prices, which both vary greatly. These singular terms tell a lot, and if – like the vast majority of the world – you’re a frequent drinker of coffee, they’re actually quite helpful to know. It’s not just coffeehouse gibberish anymore! Their key differences begin in the ground. Robusta, like its name, is more robust and resilient than is Arabica. Robusta coffee plants can survive in far harsher climates, and aren’t as susceptible to pests. Arabica, in contrast, is much more fragile of a plant, requiring attentiveness to pests, in addition to needing rich soil, both sun and shade, moisture, and higher elevations. Robusta can be found growing primarily in Africa and Indonesia, whereas most Arabica is found in subtropical, more humid climates, like Columbia, Honduras, and Vietnam, with the most tons hailing from Brazil. Robusta also produces more product per acre, and is overall cheaper in tending costs. Because of this, Robusta beans are far cheaper than Arabica beans. But why then, purchase anything other than Robusta if it’s cheaper? The quality and taste of Arabica greatly surpasses the gustatory attributes of Robusta. It’s why 70% of the world’s coffee production is based around it, and not the other way around. Arabica coffee beans entertain a wide, interesting array of flavors and aromas, but when unroasted, will most often illicit a blueberry-esque fragrance. These flavors and aromas can range from soft to sweet to fruity, flowery, or tangy, depending on where the bean was cultivated, how it was cultivated, and eventually, how it is roasted or prepared. 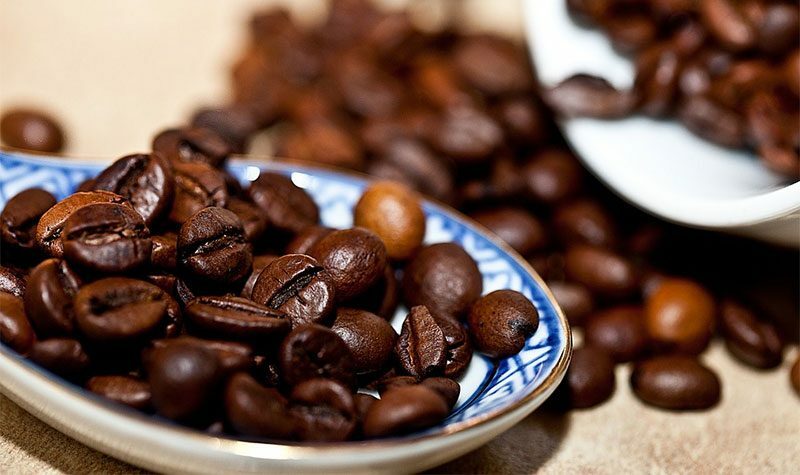 Arabica coffee beans are also twice as rich in lipids and sugars. Robusta, however, is best described as having an earthy or oatmeal-like taste with a nutty scent. They are more bitter, more acidic, and possess a neutral to harsh taste range. What’s the one more appealing consumer aspect Robusta does have going for it? Robusta beans contain nearly double the amount of caffeine that Arabica has. It is this difference in caffeine levels that actually contributes to Robusta’s infamously more bitter flavor profile. Its smoother, more colorful offerings make Arabica of course, the most sought-after between the two. If you order a latte, or any other coffee-based drink from your local coffeehouse, you are mostly likely drinking a blend that is all Arabica, or primarily Arabica. The same goes for pre-packaged coffee drinks at the grocery store. Most blends of coffee on the shelves are also primarily Arabica-based, if not specified to be 100% Arabica. Robusta generally makes its appearances in instant coffee, and as a cheaper filler mixed into blends of the two. If unlisted or you can’t tell which coffee is which, look to the shape of the unground beans; Robusta beans are much more circular in shape, while Arabica beans are more ovular. Likewise, Robusta beans tend toward a darker shade while Arabica beans tend toward a lighter brown. If you have to choose, go with the bag of Arabica for all-around better satisfaction. That doubled caffeine content in the bitter Robusta can be awfully tempting on those early mornings, though.